Interstate 15 has 25 active business routes, almost all of which replaced U.S. 91.
Business Loop I-15 through Escondido is one of the best-signed business routes in California. It follows Centre City Parkway, an expressway-grade route through Escondido between Exits 28 and 34 from I-15. 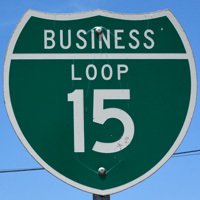 Business Loop I-15 represents a former routing of U.S. 395 through North San Diego County. An even older alignment for U.S. 395 traveled through the city along Escondido Boulevard. Interstate 15 and South Direct Connection undercrossing near Escondido south city limits over Centre City Parkway to Interstate 15 and Escondido Expressway near Escondido north city limits. The Lake Elsinore business route for I-15 comprises both a 3.3 mile loop along Diamond Drive, Lakeshore Drive and Main Street (old California 71) between Exits 73 and 75, and also a 2.6 mile spur extending west on Lakeshore Drive to California 74. According to the California State Highway System Signing Log (October, 1991), Business Loop I-15 runs from Interstate 15 and Main Street over Main Street to Graham Avenue. Loop 15 “north” runs from Main Street over Graham Avenue to Riverside Avenue (California 74), and Loop 15 “south” runs from Main Street over Lakeshore Drive and Railroad Canyon to Interstate 15.
Business Loop I-15 through Lake Elsinore is locally maintained and poorly signed beyond the freeway. A sign assembly previously acknowledged the north end of the business loop at California 74. It was removed sometime after 2011 during a landscaping project for a local business. Norco is short for “North Corona.” Business Loop I-15 here follows Second Street west from Exit 98 to Hamner Avenue (old California 31) north. Hamner Avenue parallels I-15 north to Sixth Street, which returns Business Loop I-15 to Interstate 15 at Exit 100. The 2.6 mile route is locally maintained. It was not inventoried in the 1991 state signing log. 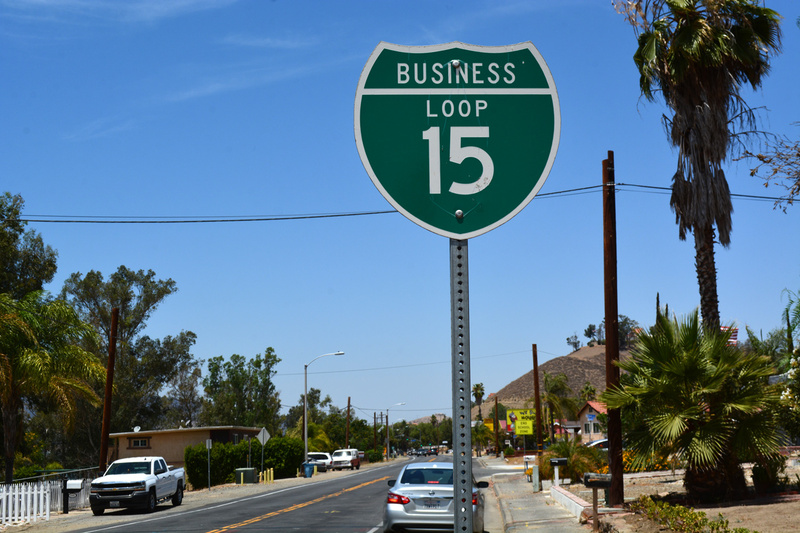 The Victorville business route is locally maintained with the exception of its concurrent section with California 18. Business Loop I-15 follows Seventh Street and D Street (California 18) between Exits 150 and 153A. Forming an L-shaped route for 3.8 miles, Business loop I-15 is also part of Historic U.S. 66-91.
from Interstate 15 and Palmdale Road overcrossing over Seventh Street and State Route 18 (D Street) to Interstate 15 and Legislative State Route 18 separation. San Bernardino County 66 signs were posted along the former route of U.S. 66 in 2012. This included installations along the business loop segment in Victorville. 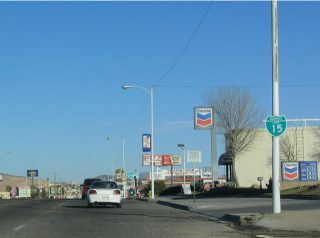 Business Loop I-15 serves Barstow via L Street and Main Street along portions of Historic U.S. 66 and old U.S. 91 between Exits 181 and 184. This 4.8 mile business loop is somewhat unusual in that the northern terminus is actually located at Interstate 40, east of I-15. The California State Highway System Signing Log (October, 1991) inventoried the Barstow business loop as following Main Street. The route is well posted in both directions. County Road 66 shields were added to the route in 2012 to acknowledge the former alignment of U.S. 66. Baker provides a major oasis in the Mojave Desert for food, gas and lodging. The census designated place is also home to the 134 foot tall Baker Thermometer, the world’s largest. Locally maintained, the 3.6 mile long business loop for I-15 through Baker follows old U.S. 91-466 between wye interchanges at Exits 245 and 248. No signage, either from the freeway or along the main street, exists for Business Loop I-15. The Baker loop was also not listed in the 1991 state signing log. A few maps, including a Compass map of Las Vegas, referred to former Nevada 604 (Las Vegas Boulevard and The Strip), and possibly former Nevada 601 (Main Street), as Business Loop I-15 in the 1980s. Despite the map references, no signs for the business route have ever been observed along the Strip. The lone business route for I-15 in Nevada loops 3.5 miles through Mesquite via Mesquite and Sandhill Boulevards from Exit 120 east to Exit 122. The loop was previously a part of Nevada 141 and mostly follows old U.S. 91. SR 144 was decommissioned in 2005, but signage for the business route remains. With local maintenance, it is unclear if the business route will continue to be signed. Business Loop I-15 through St. George travels 4.4 miles. The route travels north-south along side Utah 18 (Bluff Street) between Exit 6 and Utah 34. Utah 34 (St. George Boulevard) leads the route back to I-15 at Exit 8.
Business Loop I-15 through Cedar City follows Utah 130 and portions of former U.S. 91 between Exits 57 and 62. The route is unmarked along Cross Hollow Road and Main Street. Business Loop I-15 follows Utah 143 (200 South) east from Exit 75 to Main Street and the Parowan city center. The nearly four mile long route returns to I-15 via Utah 274 (Main Street) along old U.S. 91 to Exit 78.
Business Loop I-15 overlaps with Utah 160 over the former route of U.S. 91 (Main Street) between Exits 109 and 120. Utah 21 east and Utah 153 west end at the business route in the Beaver city center. Traveling 4.2 miles east from Interstate 15, Business Loop I-15 overlays Utah 99 along old U.S. 91. The route angles northeast from Exit 163 to 500 South. Main Street leads the business loop north to the city center en route to a diamond interchange (Exit 167) at Cedar Mountain Road. 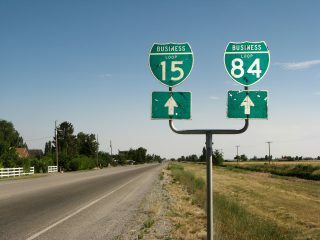 Business Loop I-15 used to follow Utah 64 north from Exit 174 to Main Street (old U.S. 91) through the town of Holden. Utah 64 ends a 2.02 mile route at the turn of U.S. 50 north of the town limits. U.S. 50 extends northeast from there to combine with I-15 at Exit 178. This was the northern extent of the former business loop. No signs of a business loop remain in Holden. Furthermore, a no services sign was added for the SR 64 exit from I-15 as of July 2008. 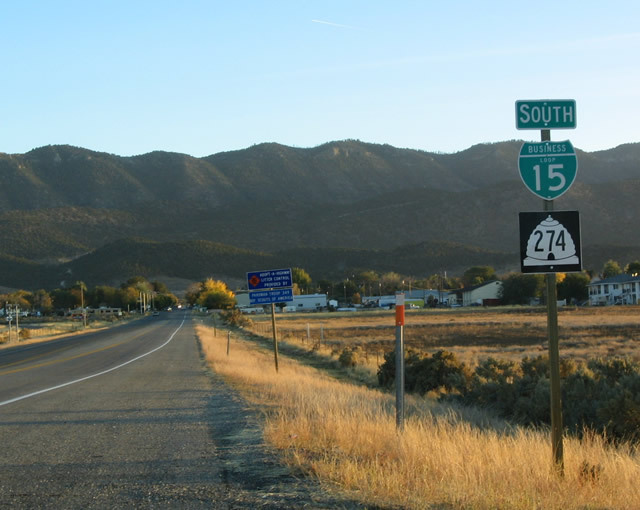 The Juab County seat of Nephi sees three interchanges from Interstate 15. Two represent the end points of Business Loop I-15, which follows old U.S. 91 on Main Street. The 4.9 mile route runs in tandem with Utah 28 north from Exits 222 to 228. SR 28 replaced SR 41 along the loop when it was extended north from Exit 222. The Interstate Business Route policy was approved in Utah by the State Road Commission in April 1973. A number of routes were established, while other qualifying cities never implemented them. Payson could have posted a business spur from I-15.1 The route may have utilized 800 South (SR 178) east to old U.S. 91 (SR 198) from Exit 249 or Main Street (SR 115) south from Exit 250 to the city center. Spanish Fork qualified for a business loop from I-15 per the 1973 policy adopted by Utah.1 A possible route included 8000 South and Arrowhead Trail (SR 164) east from Exit 253 to old U.S. 91 (Main Street), and Main Street (SR 198 / SR 156) north to Exit 257. The 1973 policy specified that a second business spur from I-15 could have been implemented from I-15 east to the city of Springville.1 The route likely would have used 400 South (SR 77) east from Exit 260 to U.S. 89 (Main Street) at the city center. It was not posted in 1990 and probably never was. This business loop was previously routed along Utah 126 (Main Street) through Layton. Dan Stober reported that guide signs posted on I-15 north for Exit 332 referenced Business Loop I-15, but that beyond the freeway along Utah 126 and Main Street, signs were not present. A follow up visit by July 2008 revealed no signs for the route along Interstate 15. 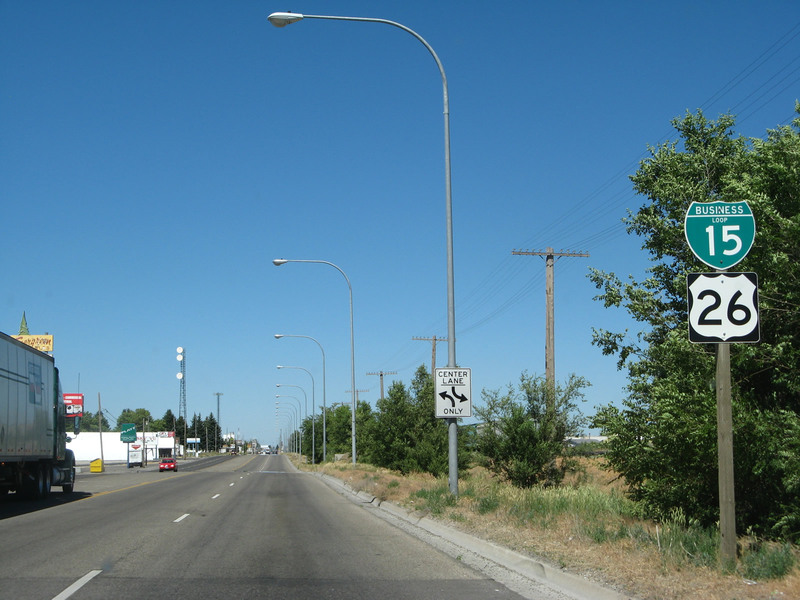 As first reported by Dan Stober on November 21, 1998, the Brigham City business route for I-15 & 84 consists of a 7.7 mile loop east through the Box Elder County seat. 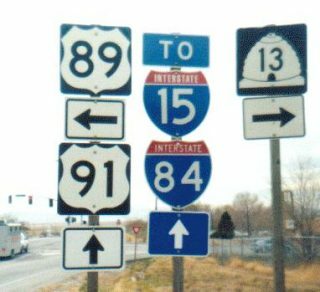 The south leg of the route follows U.S. 91 from a July 2014-completed diverging diamond interchange (Exit 362) east to U.S. 89 and Utah 13 at Main Street. Utah 13 (Main Street) leads the route north through the city center to Utah 38, where the tandem turn west to Interstates 15 & 84 at Exit 365.
Business Loops I-15 & 84 run concurrent throughout the alignment, with shields posted along Main Street, at the junction of U.S. 89 and 91 and on the southbound off-ramp to Utah 13. These were noted in July 2016. Mainline signs from Interstates 15 and 84 omit the business routes and instead display U.S. 91 at the south end and SR 13 at the north end. The Brigham City Business Loop is unsigned from the I-15/84 mainline but acknowledged by this assembly on the southbound off-ramp. Several fires underway in the area too. A second dually signed route for Business Loops I-15 & 84 branch north from Interstates 15 & 84 at Exit 376 in the town of Elwood. The pair follow Utah 13 (5200 West) north to a rural intersection with Utah 102 (Main Street), where they turn west into the city of Tremonton. Beyond the city center, Business Loop I-15 rejoins I-15 via the locally maintained roads of 1000 West and 1000 North to Exit 381. Business Loop I-84 remains paired with SR 102 to I-84 at Exit 40. 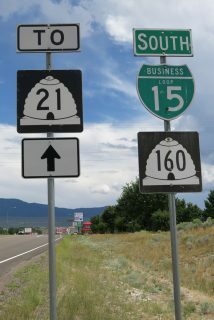 Shields or trailblazers for I-15 and I-84 were posted on Main Street at 1000 West and other turns the routes make as observed in July 2016. Tremonton Business Loop. Signed well for the most part. The 1995 DeLorme Idaho Atlas indicated that a connection to old U.S. 191 in Malad City was a business route. However, subsequent field inspection in 2008 confirmed that this business spur was not posted. Business Loop I-15 serves the city of McCammon, partially along the old route of U.S. 91 & 191. The route stems east along Jensen Road to State Street from Exit 44. State Street winds northward across agricultural areas to the city street grid, where Business Loop I-15 shifts to Center Street to the McCammon business district. A short overlap with U.S. 30 returns the loop to Interstate 15 at Exit 47. Several shields were observed along the route in August 2016.
Business Loop I-15 overtakes a portion of old U.S. 30-91-191 between a wye interchange (Exit 57) and half diamond interchange (Exit 58) through the city of Inkom. An end sign stands at the split with Old Highway 91 southbound as of August 2016. A handful of services line the route otherwise. Interstate 15 travels along the east side of Pocatello on a hill overlooking the city while Business Loop I-15 provides direct routes to both the city center and Idaho State University. The route branches northwest from Exit 67 along 5th Avenue, which doubles as U.S. 30 and 91. The trio separate into a couplet with 4th Avenue carrying southbound traffic to Pocatello Avenue. U.S. 30 splits with the business route at Oak Street while U.S. 91 & Business Loop I-15 shift to Yellowstone Avenue, a five-lane commercial boulevard. U.S. 91 remains north along Yellowstone Avenue en route to Chubbuck while Business Loop I-15 turns east along Alameda Road and Pocatello Creek Road to end at Exit 71. The Business Loop I-15 overlap with U.S. 91 was well signed as of August 2016, while the east-west branch to Exit 71 was less acknowledged. The Blackfoot business route for I-15 overlays U.S. 91 (Broadway and Main Streets) from Exit 89 north to the city center. This section was previously the alignment of U.S. 191. The remainder of the route west along the couplet of Bridge and Judicial Streets and the commercial arterial back to I-15 at U.S. 26 (Exit 93) is a stand alone route. 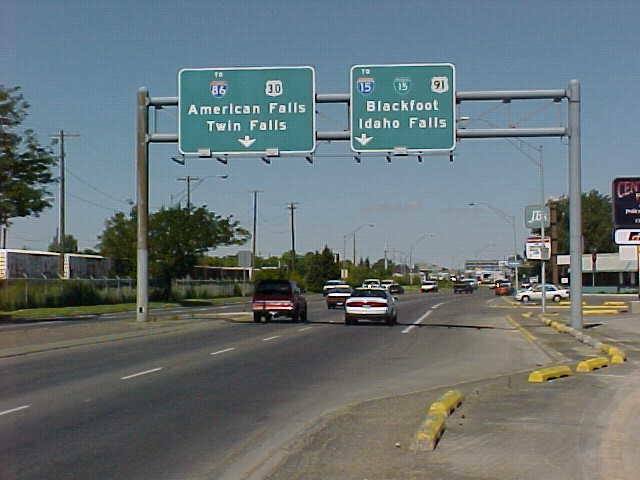 During the late 1980s and early 1990s, Rand McNally incorrectly showed Business Loop I-15 following all of U.S. 91 between Blackfoot and Idaho Falls. Several shields were noted between Exit 93 and U.S. 91 during a August 2016 visit. Beginning at Exit 116, Business Loop I-15 combines with U.S. 26 east along a four-lane arterial to cross the Snake River and intersect the north end of U.S. 91. U.S. 26 & Business Loop I-15 turn north at Sunnyside Road to parallel a railroad corridor northward to Yellowstone Avenue (old U.S. 91) and Downtown Idaho Falls. Broadway Street takes Business Loop I-15 & U.S. 20 Business west across the Snake River at the actual Idaho Falls to Exit 118. U.S. 26 east meanwhile overlaps with U.S. 20 Business northeast to Northgate Mile. End for both I-15 Business Loop and the U.S. 20 Business loop at I-15. Dillon represents the main service center along the I-15 corridor between Idaho Falls, Idaho and Butte, Montana. A 3.3 mile business loop there joins the city center with Interstate 15 from Exits 62 and 63. 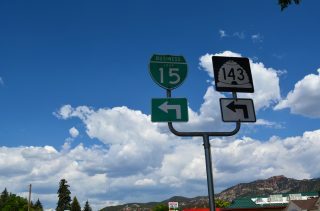 The route zigzags through the street grid along a combination of Atlantic, Helena and Montana Streets, which collectively represent old U.S. 91. Business Loop I-15 also provides the connection between Interstate 15 and Montana 41 north to Twin Bridges. Interstates 15 & 90 overlap for 7.65 miles across Butte and Silver Bow County. The tandem combine in a rural area west of Rocker and split outside the Floral Park neighborhood of the city. A dually signed business route for both routes connects I-15 & 90 with the Downtown Butte between Exits 124 and 127. Business Loops I-15 & 90 overlap with I-115 east to Iron Street, where they make a horseshoe shaped route north along a combination of Montana Street, Park Street and Arizona and Utah Avenues. Harrison Avenue (old U.S. 10 & 90) angle the routes southeast along a commercial boulevard to I-15 & 90 opposite the north end of Montana 2. The USGS Topo map shows Business Loops I-15 & 90 taking a shorter route from Interstate 115 and Iron Street east to Montana Street south and Front Street east. A pair of older shields stand at the Front Street intersection with Utah Avenue, where the two different alignments combine east to Harrison Avenue. The capital city business loop for I-15 takes a convoluted 4.4 mile route west from Exits 192 to 193. Signs reference the route from the freeway mainline, but the route itself is poorly posted. U.S. 12 runs concurrent with Business Loop I-15 along a couplet of Prospect Avenue west and 11th Avenue east between a parclo interchange with I-15 and Montana Avenue. Trailblazers for U.S. 12 take the place of Business Loop I-15 shield along westbound while I-15 trailblazers are posted eastbound. U.S. 12 turns north onto Montana Avenue and west along Lyndale Avenue to bypass the Helena city center. The business loop extends west along 11th Avenue through residential neighborhoods to Cruse Street and Last Chance Gulch at Downtown Helena. This stretch of the route is unmarked. An array of trailblazers for both Interstate 15 and U.S. 12 stand at the five point intersection of Cruse Street, Helena Avenue, Neill Avenue and Last Chance Gulch. These assemblies direct traffic on Last Chance Gulch north and 11th Avenue east for Business Loop I-15 and 11th and Neill Avenues for U.S. 12 Business. Last Chance Gulch leads northeast to become Cedar Street, a commercial arterial returning Business Loop I-15 to I-15 across from Helena Regional Airport (HLN). Erroneous trailblazers for Business Loop I-15 are posted along the route eastbound at both U.S. 12 (Lyndale Avenue) and Montana Street while U.S. 12 trailblazers line westbound. Vastly unsigned Business Loop for I-15 in Helena. Two of the three Great Falls interchanges from Interstate 15 connect with Business Loop I-15. The southern extent emerges from a trumpet interchange (Exit 278) along side unsigned Interstate 315, U.S. 89, Montana 3 & 200. A short freeway ensues east to the signalized intersection with 6th Street (old U.S. 89 Bypass & U.S. 91) north across the Sun River. With I-315 ended, Business Loop I-15 and company transition to 10th Avenue South across the Missouri River. East of the river, 10th Avenue South constitutes a busy commercial arterial to Holiday Village Mall, U.S. 87 (14th / 15th Streets) and the University of Great Falls. Business Loop I-15 meanwhile splits with U.S. 89 & Montana 3-200 for the couplet of 5th and 6th Streets. The one-way pair take the route north to Downtown Great Falls, where a second couplet (1st and 2nd Avenue North) turns the business loop back west toward the Missouri River. 1st Avenue North carries two way traffic west from Park Drive and Gibson Park across the Missouri River to Central Avenue. Central Avenue concludes Business Loop I-15 at a diamond interchange (Exit 280). The Conrad business loop for I-15 overlays a portion of old U.S. 91 along a 5.7 mile loop west from Interstate 15. The route starts at a rural diamond interchange (Exit 335), south of the city, to overtake Highway 91 west from Midway Road. Main Street leads the route north to the city center and back to I-15 at Exit 339. A number of traveler services line the route at the north end of Conrad. The route is well posted in each direction. Last sign for BL I-15 in Conrad. 2013 shield, 2016 banner. Shelby lies at the crossroads of Interstate 15 and U.S. 2 in far northern Montana. The regional service center is also the site of the BNSF Intermodal Hub. The two interchanges for the Tooele County seat represent the end points of the 3.0 mile long Business Loop I-15 through Shelby. Business Loop I-15 combines with U.S. 2 east from Exit 363 along Front Street to the city center, where both routes dog leg south on 5th Avenue to Main Street. U.S. 2 takes Main Street east to exit the city while the business route ascends onto a viaduct over the BNSF Railroad yard. Oilfield Avenue (old U.S. 91) returns the route north to I-15 at Exit 364. Shelby, Montana Business Loop. The loop also has it's own truck route to circumvent downtown from the east. Page updated June 28, 2018. Northbound Business Loop I-15 shield posted along Main Street in Barstow, California. Photo taken 01/20/04. Business Loop I-15 in California follows old alignments of U.S. 395, U.S. 91 and U.S. 66.
Business Loop I-15 southbound travels with Utah 274 from its beginning at Exit 78 in Parowan. Photo taken 10/24/03. Business Loop I-15 & SR 143 shields at the northern turn from 200 South to Main Street in Parowan, Utah. All Interstate business loops in Utah are cosigned with state routes. Photo taken 07/15/17. Business Loop I-15 loops east into the city of Beaver with Utah 160. Photo taken 08/17/13. Business Loops I-15 & I-84 south turn west from the ending Utah 13 to accompany U.S. 91 back to I-15 & 84. U.S. 89 branches south from U.S. 91 along Main Street to the city of Perry. Photo taken by Dan Stober (03/15/01). 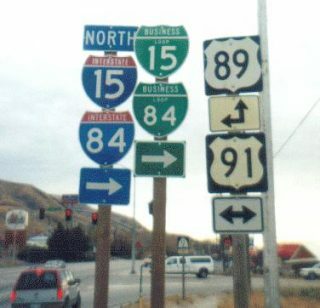 U.S. 89 & 91 conclude a 25-mile overlap from Logan City at the south end of Utah 13 and turn of Business Loops I-15 & 84 west from Main Street onto U.S. 91 in Brigham City. Photo taken by Dan Stober (03/15/01). Business Loop I-15/84 south at the rural town of Elwood in northern Utah. Photo taken 07/13/08. U.S. 30 separated from Business Loop I-15 & U.S. 91 north in Pocatello for an expressway leading west to I-86. Photo taken by Kelly Kawamoto (09/05/00). This set of signs was replaced after 2008 when the intersection of Pocatello Avenue and Oak Street was expanded to include dual turn lanes for U.S. 30 west and two through lanes for Yellowstone Avenue north. Traveling north along Business Loop I-15 and U.S. 26 between U.S. 91 and Idaho Falls, Idaho. Photo taken 07/13/08.